If you have a business of any kind, you might already have invested in making your own price list to tell your clients about your services and prices. That can apply to different kinds of businesses, including salons. After all, you would need price list templates in order to let your clients know exactly what you can do for them with regard to beauty so that they can make an informed decision about whether or not to patronize your salon. 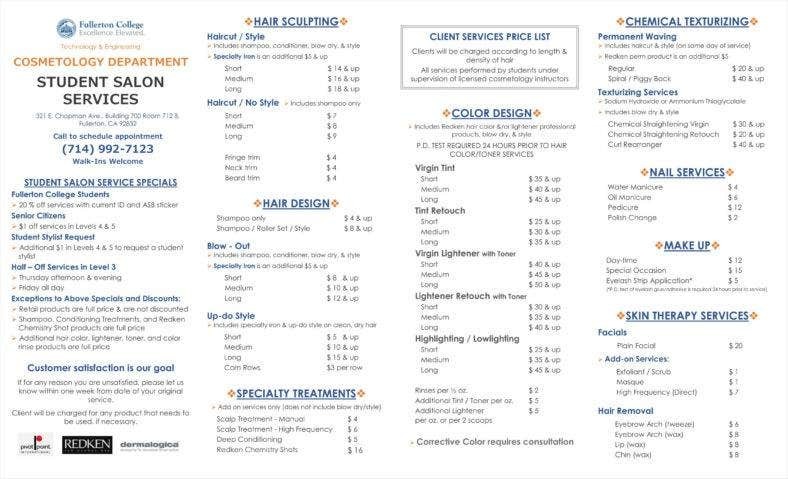 Like other examples of sample price lists, there are some elements of salon price lists that you should keep in mind before going off to make your own. 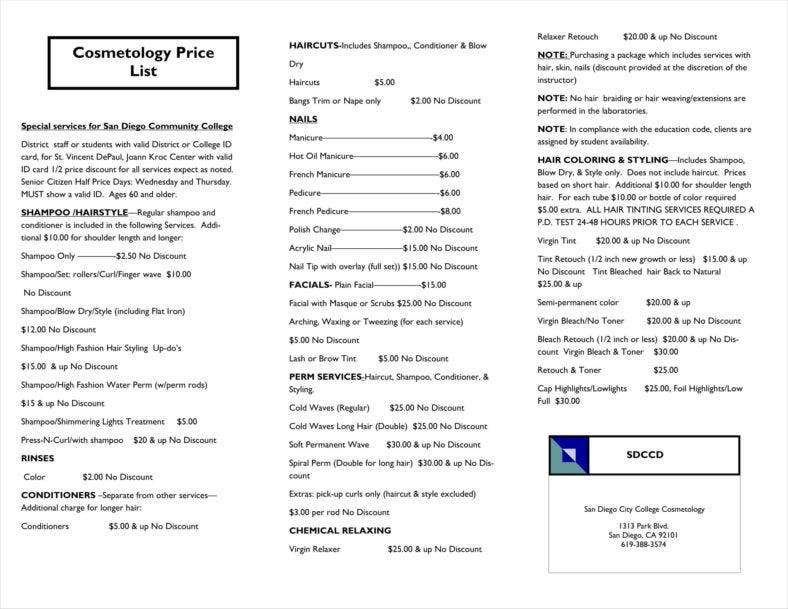 There might be some elements common to similar documents like general price list templates, but you do still have to consider some of the unique aspects of a salon price list. This advice could even go so far as to help make sure that you make your eventual salon price lists as effective as possible. One piece of information that should be able to help you in this instance is what salon price lists are actually capable of. After all, there should be a number of different tasks that these price list templates can carry out for you. But while this does include simply listing all your prices and services, there are more functions your own salon price lists should be able to carry out for you. The most obvious function your price list templates in Excel can do for you is simply communicating how much your services should cost your clients. There is, however, more nuanced than simply informing your customer based on that fact. This should also give your clients a very clear idea of just how much your services actually cost, particularly if they intend to avail of more than one service at a time. Some clients might actually want to plan out how much they intend to spend beforehand, after all. In any case, this is very definitely basic information that your salon can convey to any potential customers that can help influence them to actually take advantage of whatever services you have to offer. Describing what services that particular salon has to offer. 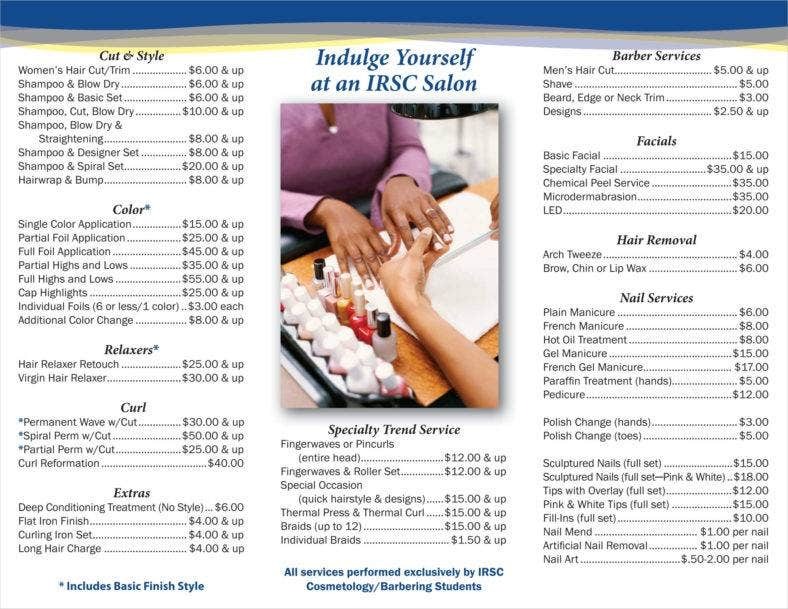 Your salon price lists can also be used to advertise whatever specific services your establishment has to offer. While there is some overlap between all the services salons offers in general, not all salons actually offer the same services. 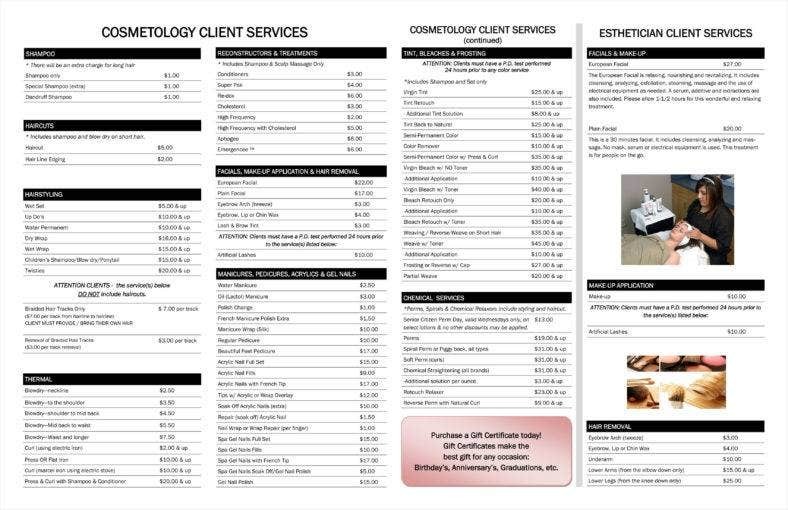 Like some examples of service list templates, your salon price list templates can give your clients a very concrete idea of what you can do for them. For example, depending on what you have on offer you might be able to attract clients looking for haircuts, manicures, facials, and other services salons offer. Your salon might not actually offer all those potential services, so it would be more convenient for your clients if you did specify what you can offer them. Allowing clients to compare costs between businesses. One implicit function of your price sheets in Excel, especially when you consider that your competitors are likely to have their own salon price lists, is that they can allow your clients to compare between those different establishments. This is actually quite useful as you can study how your clients choose between all their choices in order to help determine your overall business strategy. In any case, you can always take note of your customer base’s trends in order to decide if you need to adjust any part of your strategy so as to attract more customers. Enabling clients of the salon’s address to find its address. Documents like your salon price lists should also include your salon’s physical address. After all, this is a detail that can be found on any business’s official documents. 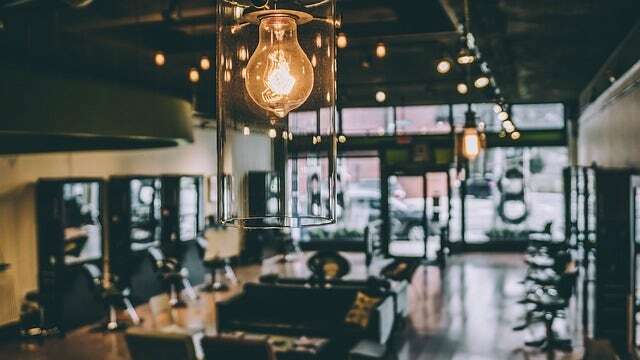 While there are some higher reasons for doing this, perhaps the most practical is that it can inform your clients of the actual premises of your salon. This can be useful information to provide, as you might be more likely to attract more nearby clients than anyone else. Alternatively, you may have other branches in the vicinity, so your price lists can also serve to inform your clients of those branches, which can still attract more business for you. Sharing the salon’s contact details. Your price lists would also include your contact information, similar to other businesses. After all, your clients may have reason to get in contact with you for various reasons. Perhaps the most relevant one is that clients may have to set appointments with you in order to avail of your services. There could be alternative reasons for having to contact the salon, such as your supplier has to speak with you, hence why it would generally be prudent to include this information. 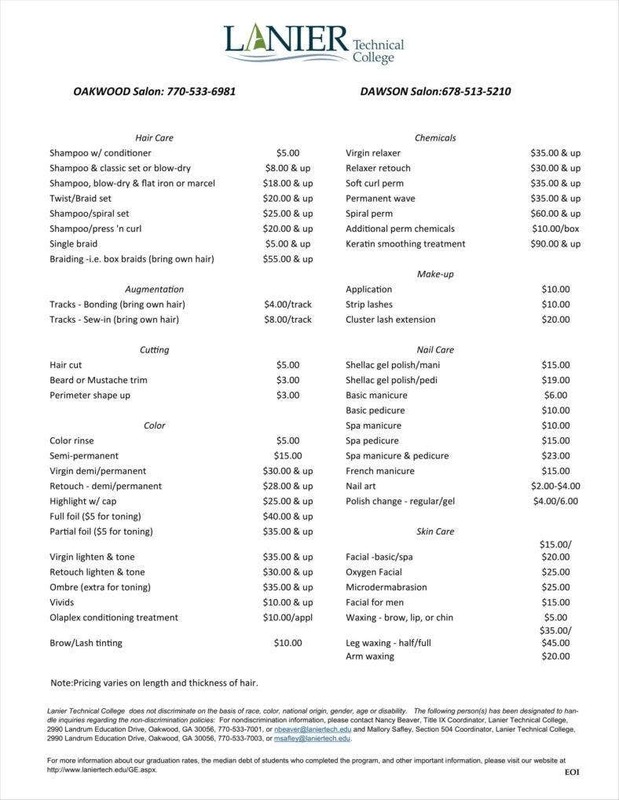 Stating the salon’s operating hours. 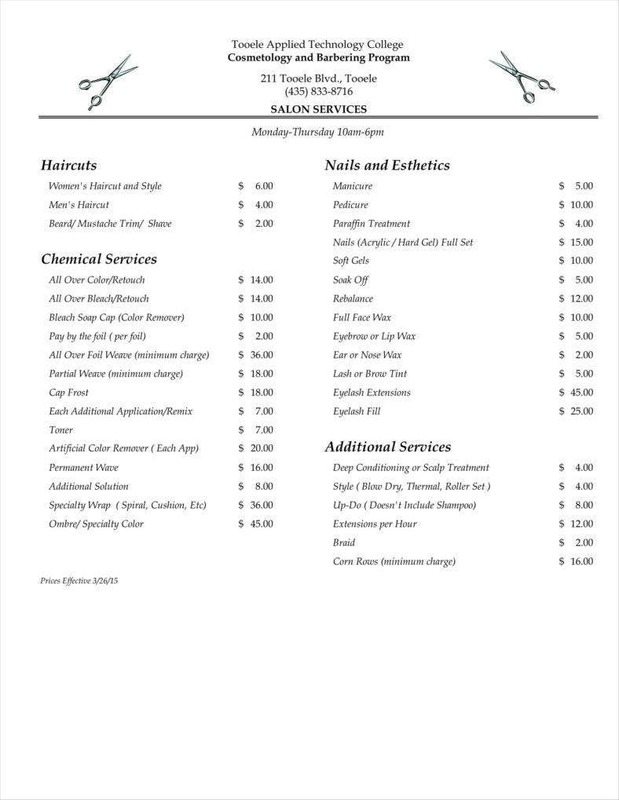 You may also want to include your salon’s operating hours in your price list templates in Word. This is further information that might be of use to your clients being that this can help them determine at what time they might want to go to your establishment. Your price list is one thing, but your clients may need more than that before making a decision to patronize your salon. After all, this can serve to let your clients know exactly when you are open so that you can serve them. Providing indirect marketing for the salon. 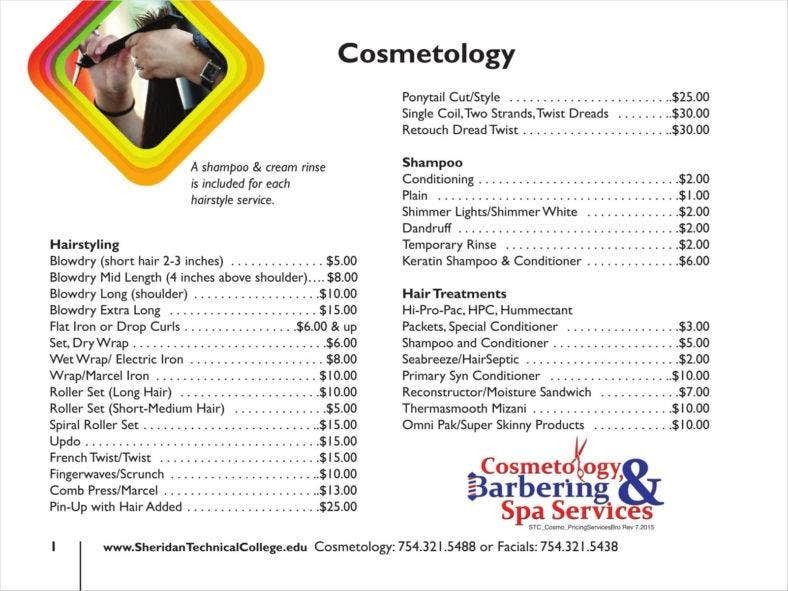 Your price lists can actually serve a similar purpose to other documents like beauty parlor brochures. After all, since your salon price lists already state your address, contact details, services, and other information, there is nothing stopping you from using your price lists as a means of indirect marketing. After all, by listing all this information, you can make it much easier to attract more customers. You never know who might find one element or another in your salon price list interesting enough to justify going to your salon. In order to make sure that your price list templates are as useful and convenient as possible, you might want to make use of certain tips. These tips could very well help you make sure that you have made the most of any list templates that you might end up using in order to make your salon price lists. Be sure to have a complete list of services. It can definitely help your case if you make sure to have as complete a price list as possible. This is vital as your clients would want to be aware of all the services your salon can give to them. As with service lists, you would need to let them know about all your services so that they can be in a better position to decide if they want to take advantage of them. 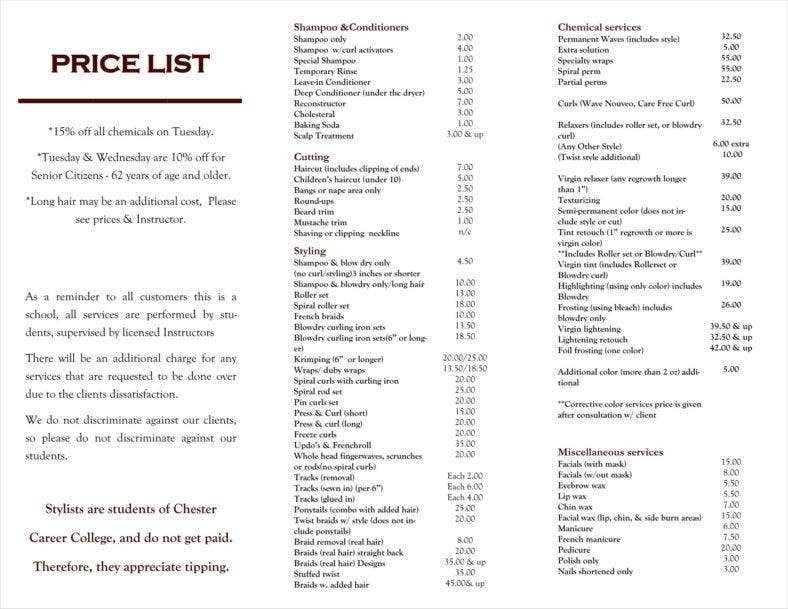 You can make the argument that salon price lists, and even price lists in general, are meant to be informative, hence the need for you to provide such information for the customers’ benefit. Always include any necessary elements for advertising. 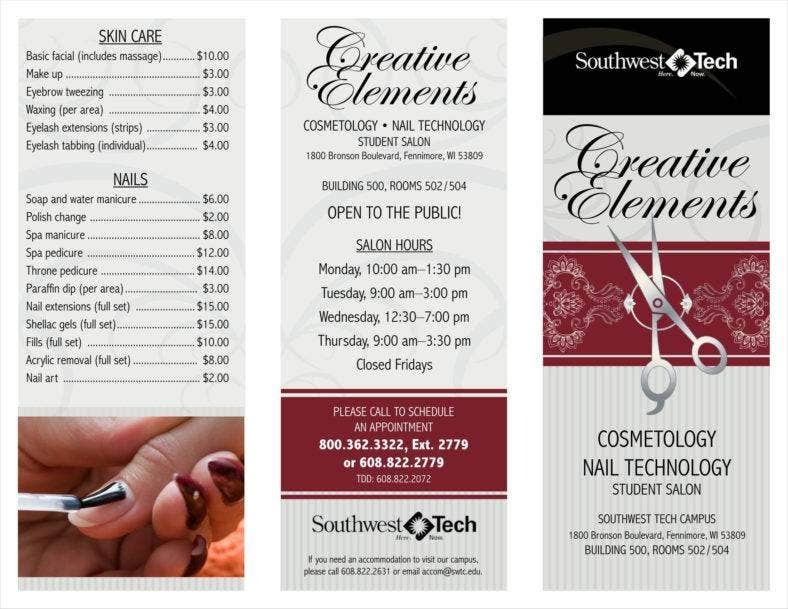 As a document that helps market your salon, you should make sure to include more advertising images in your own sample price invoice lists. After all, your salon price lists have a secondary aim of attracting as many people to your salon. With that in mind, you can intersperse your price list with related images that can serve to demonstrate your services directly to your customer base. This can serve as a more direct means of urging potential customers to you now that they can see it for themselves. State if clients have to set appointments. Some salons differ in how to secure their services. So whether you require customers to set appointments or not can be specified in your service price list templates. After all, this can be a fairly vital thing to inform your customers of, particularly if you are trying to keep them from wasting their time. This can be considered an act of consideration on your part as you would be giving your customers a simple, direct means of understanding how to actually use the services you have on offer. Be sure to inform clients of any other ancillary details. You should also take the time to state in your sample price sheets any additional details that you think they might need to know. One example is any bonuses that come with any services that your clients can expect, such as shampoo and hair-drying along with any haircuts. This can be a further means of attracting customers as many of them might be interested in any such bonuses, particularly if they are bundled with other services. Always include your salon’s address and contact details. You should always be sure to include this kind of information for at least two reasons. The first is that it is convenient for your customers as it can make it much easier for them to avail of your salon’s actual services. The other is that it serves to market your salon to more people since there are more details available for finding and contacting your establishment. After all, this serves to make your business all the more prominent, no matter how indirectly. There are always more things to consider when it comes to using document templates than you might have expected. However, these insights can serve to help you make sure that you are following all the steps to make the most of the salon price lists you make and use.